How is it that even a kids clown costume can be creepy? We're not saying every kid in a clown costume, or even every clown has a scary vibe, but even an ordinary, innocent costume sets off our creep alarm if it's a clown. But why is that? Let's start at the obvious: big clown shoes. Now we don't mean that big feet are a problem, but clown shoes always look inflated, like someone stuck a bicycle pump in there and didn't stop pumping for a few days. And now those shoes are close to popping! But does the clown mind? Apparently not. Okay, maybe it's not the shoes. How about the outfit then? We've got some mismatched fabrics, bright flashy colors, plenty of warning signs if you were to see this guy on the street. Why not just get a nice three-piece suit instead of this noisy, off-putting ensemble, right? And another point, how on earth did you use two different fabrics for the body but then switch those fabrics for the arms? That's just creating too much effort. Work smarter, not harder, clown! Okay, maybe it's not the outfit (it's totally the outfit but we're willing to explore some alternate avenues of investigation). Let's talk about balloon animals. Clowns are always making balloon animals. But why? Can't make real animals? Probably not! Aha! Typical clown: no real animals so they make fake animals. How do you think that would make a child feel? Being handed a fake animal? That's just cruel. Alright, we're being a little harsh. Balloon animals are actually pretty cool and we're just jealous clowns can make them out of thin air (well, and balloons). 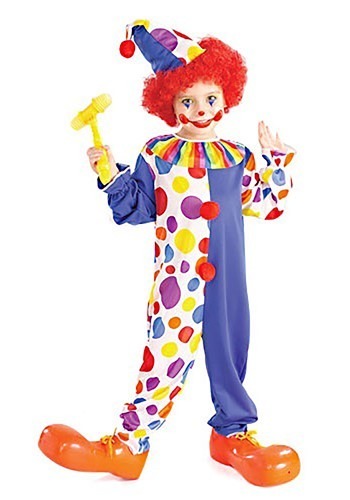 So let your child dispel the myths of clowns by wearing this clown costume and make it as adorable as they are! If your kid loves clowning around then this is the perfect costume. This Kids Clown Costume is cute and colorful and great for entertaining a crowd. Ride around on a tiny tricycle and make balloon animals while your a silly clown. Make your audience roar with laughter!